We recently finished a successful The Church Network conference in DC. Hundreds of church administrators gathered together to learn and fellowship. I spoke at the communications Fast Track, conducted live on-the-spot web and brand analyses, met with dozens of people who stopped by our expo booth, and finished the week with a session about church communication. Little Return on Invest. The scenario is often explained this way: “We have a person in charge of our church communication. They seem very busy, so they want to hire more staff, buy more ads, and improve our website with third party companies that seem to cost so much. With all the money, I don’t see a proportionate benefit for our church.” If this is you, you need to ask your communicators to set goals before expenditures are made and then conduct follow-up meetings so budgets are justified. Good communications should have a visible, positive return. The Church isn’t Growing. The vast majority of American churches are feeling the crunch. They’re not growing. How can we have all this communication while fewer people are coming to our churches? Is anything actually working? If this is you, you need to reexamine the goals you have for church communication. Establish the importance of external communication as well as keeping your congregation informed. 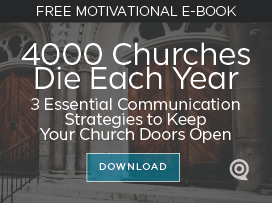 Good church communication has a strategy that reaches both groups, unifying itself under a key positioning statement (tagline) about the simple benefit of attending your church. And it must speak to the needs and goals of a community so it will attract more to your congregation. That’s good church communication. Our Website is Still Broken. 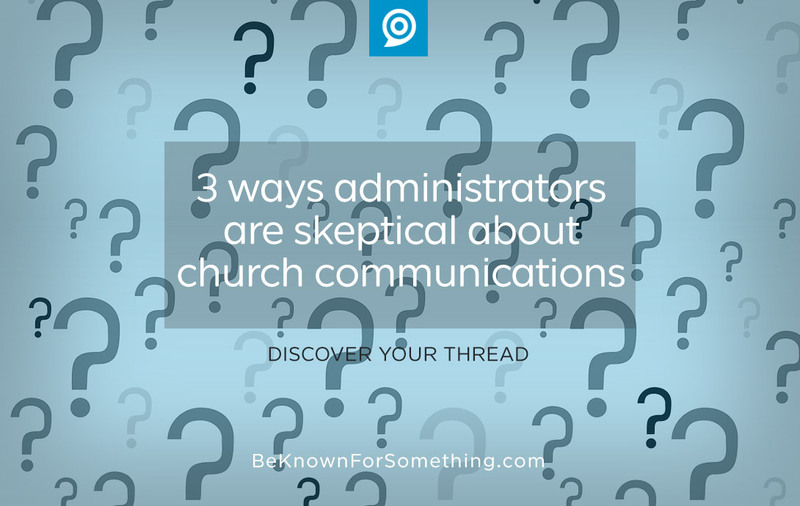 “All this attention to church communication and everyone seems to complain about our website or ignore the information on it. It’s one of the biggest expenses, and yet it feels broken.” If this is you, you need to take a hard look at your website. It probably IS broken. In order for your digital hub to actually communicate and be effective, your website must be organized properly so people can easily find what they’re looking for and discover edited, simplified content that engages them and the community. If it’s not working, you must fix it. Can’t seem to do it now? Find someone who will guide you and show you best practices. Skepticism isn’t wrong; often it raises issues to light that need to be addressed. After a successful conference, we all have a list of things we need to fix and improve. Let’s ensure that we accomplish them so that our skepticism isn’t in vain. Let’s get our communications right, let’s reach our communities so our churches will become known to them, and ultimately so we can introduce them to Jesus. That’s worth the investment!